Our dream is to travel the world, but so far Rob and I have covered 53 countries across South America, Europe, Africa and Asia. The Middle East is our dream destination and while we haven’t set foot there, we invited a fellow travel blogger to write about the top travel destinations there. 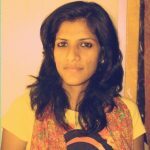 Neha from Dubai Wikia blog is sharing her experience with us and talking about how much does it cost to travel to Dubai, on a budget or in a very luxurious way. The nomadic life across the world is fun, interesting, exciting, and at times, risky too. Rest assured, it is everything but boring. While traveling liberates you from inside, it also helps you adjust to every possible situation. I have lived in extreme conditions in Cambodia and therefore, coming to a luxury city like Dubai was a welcome change. As I discover more and more about this fantastic city, I want to share with you how much does it cost to travel to Dubai and how to make your money last longer. For those who say Dubai is not a backpacker’s paradise, you are right. It is not a paradise but it certainly is a great place to visit for backpackers even with a shoestring budget. If you’re willing to let go of the enticing luxuries and tempting lures of Dubai, you sure can live in Dubai for cheap and still take a sneak peek into the soul of the Arabian city. First of all, before talking about how much does it cost to travel to Dubai, you need to understand a bit about the city. Dubai is a part of the seven emirates of the UAE and its most popular one. The city receives millions of tourist’s footfalls every year from all over the world. With only 15% local Emirati population and 85% expats, Dubai has an adorable cosmopolitan culture. But what’s surprising is the fact that the emirate is still firmly connected to its roots and every citizen observes the rules and regulations to be there in peace. Emirati Dirhams is the currency used in Dubai and 100 AED = $27. Arriving in Dubai is not a very costly affair if you’re not visiting the emirate during the famous Dubai Shopping Festival. However, to book at the best rates, it is better to book in advance. If you’re looking for economic package tours, I would recommend Rayna tours for best rates. They are one of the most popular local tours and are well organized. Or give a look at TripAdvisor reviews. BOOK YOU TOURS IN ADVANCE! You can reach Dubai from other neighboring emirates too. Landing at Sharjah instead of Dubai is a much cheaper option as the road distance between the two amazing emirates is hardly 20 kilometers. So, you can save money by booking a flight to Sharjah instead of Dubai directly. To find the best flights to Dubai use Kiwi.com or Skyscanner. They have a useful tool for searching flight connections and the best prices. Everything about Dubai is larger than life. The roads, rails, attractions, food, and even the warm people. Known for its hospitality, the people of Dubai are eager to help you out and English is fluently spoken everywhere. It’s amazing to see so many different, vibrant people living in one place in peace and harmony. The city has a major population of Indians, Pakistanis, Bangladeshis and other Asians. Most of them are here on employment contracts. I’ve seen Emiratis showing off their pet tigers from their supercars and also the low-wage Asian laborers eating at the street side eateries for less than 4AED. How much does public transportation cost in Dubai? Metro rail – Dubai has a super-efficient metro rail system. These driverless metro trains are the fastest and cheapest way to travel the length and breadth of Dubai. To travel in the metro, you need to get an NOI card. You can’t use cash to travel. There are various tickets available. You can take a red ticket and can use it up to 10 trips or 5 day passes at the unbelievable cost of AED1. Road transport – The taxis are frequent but costlier than buses. The bus transport of Dubai is very convenient. There are many special busses that organize exclusive Dubai tours for the tourists. These tours give you an overview of the best attractions of the city in an economical way. The buses mainly serve the low-income groups and are well maintained, clean, and air-conditioned. The average cost is 2AED per ride with a prepaid NOI card, but the buses can be a bit slow, especially during peak traffic hours. Check the website www.rta.ae for more information on bus routes and fares. Monorail – Connecting the manmade Palm Jumeirah with the Dubai Marina, the Monorail has only 2 stations Gateway towers and Atlantis Aquaventure park and the round trip cost around 25AED. Abra rides – The oldest mode of transport on the Dubai creek connecting Bur Dubai with Deira, an Abra ride is a must try as it is super fun and cost you just 1Dhs to enjoy this historical ride. If you want to charter an Abra, the cost would be Dhs100. 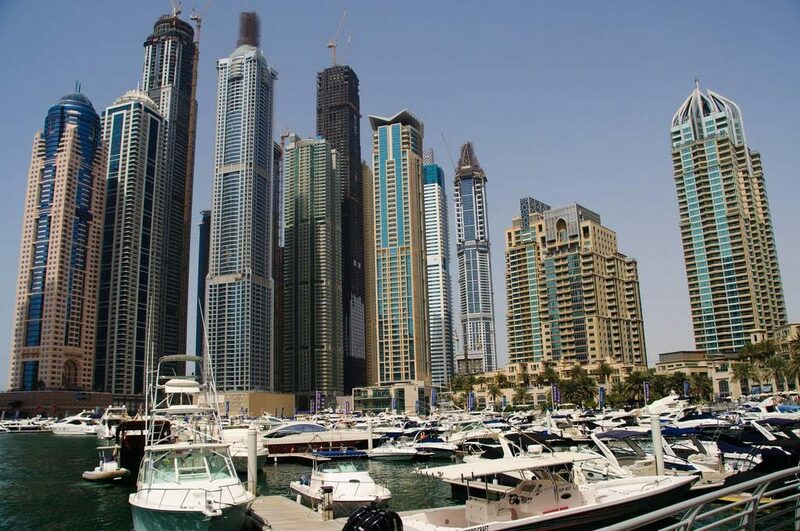 How much is the cost of accommodation in Dubai? Living in Dubai is a matter of choice. From the epitome of luxury to the economic choices, Dubai has a huge range of budget options. Finding dormitories is a bit difficult. Youth hostels are the next best option for the ones with a shoestring budget but that too is limited. Hotels in Dubai start from as low as $25 per night. If traveling in Dubai metro isn’t an issue, then you have the liberty to choose the hotels far from the main city as well. They come at a far cheaper price than the ones in the heart of the city. The urban accommodation in Dubai has no upper limit. The city boasts of the world’s most luxurious hotel- the Burj Al Arab where per night cost is a minimum of $24000. A regular urban hotel room cost somewhere around $35 -$50 per night which will have Wi-Fi, comfortable AC room with toiletries. Recreational amenities like swimming pool and gym etc. may not be accessible depending upon the hotel policies. Residence & Spa at One&Only Royal Mirage Dubai is one of the best hotels in Dubai with rates starting at USD 484/night for a double room. Raffles Dubai offers a great value for money, rooms from USD 188/night. A more affordable option is The H hotel with rates starting at USD 77/night. To find the best hotels in Dubai do your research and book via Agoda or Booking.com. There you can find accommodation in Dubai for all styles, tastes, and pockets. Check the best hotel rates in Dubai! You have to be a foodie and ready to eat everything (I mean eatable street food) if you want to save BIG on your food cost. Dubai as a city has impeccable food choices and almost every famous cuisine in the world is available here like Japanese, Indian, Chinese, Bangladeshi, Pakistani, Arabian, Emirati, Portuguese, European, Thai, and the list goes on. Dubai has a colossal range of restaurants and eateries catering to all pocket sizes. While Sheikh Zayed Road and Dubai Marina area cater to the fine diners, areas like Al Satwa, Al Karama, and Deira are the hub of economic eateries and street food joints. The average price of a full meal in an economical eatery will be somewhere around $4- $9. Fast food and local delicacies like Hummus and Shawarma sandwiches costs around $1- $2. Dubai is pretty safe when it comes to food hygiene and quality but still, you must look around the stall carefully for its cleanliness if you’re having food on a roadside eatery. The water in Dubai is regarded as safe to drink by WHO standards. So no need to buy costly mineral water bottles. You can drink water directly from the tap and not fall sick. Tipping waiters is an option and not mandatory. It is majorly applicable to fine dining where tipping goes up to 10-20% of the bill. How much will you spend on attractions in Dubai? Dubai is an out and out tourist city. Every attraction is made to please its visitors. A benchmark city for the world, Dubai is a live example of intelligent channelization of resources. How else would you describe the world entertainment hub that was nothing more than a small Bedouin fishing village just 4 decades back. World’s tallest building Burj Khalifa (three times taller than Eiffel Tower in Paris…. that’s a lot of height:) ), world’s biggest themed water fountain, world’s largest natural flower garden, and so many more attractions are world-renowned and truly magnificent. Most of these attractions are inexpensive in fact, free. Few attractions that need you to shell out a few bucks are worth every penny. 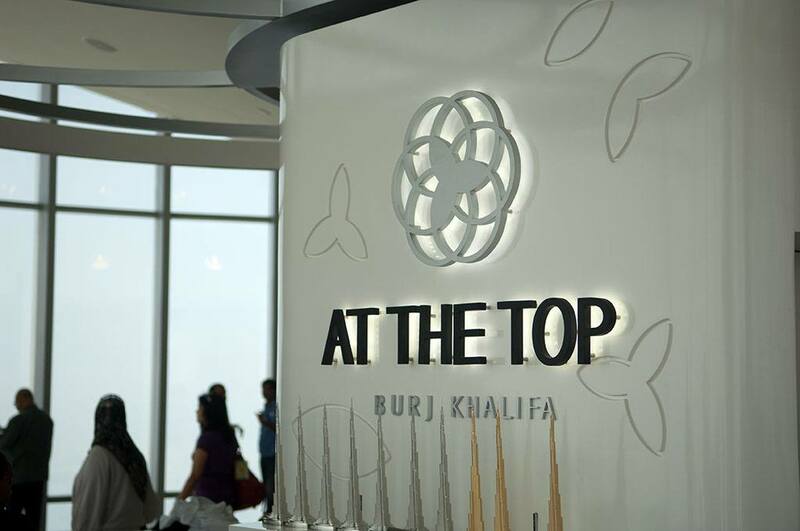 Burj Khalifa observation deck at 124th floor and 148th floor, tickets range from $35- $95. Dubai Miracle Garden – the world’s biggest natural flower garden with over 45 million flowers arranged in adorable shapes and designs is a must visit. The tickets to the garden is $8. Dubai Museum – one of the best museums in the Middle East. Once you visit the museum, relating to the city becomes easier. Ticket prices- Just 3AED, yes, less than $1. Attractions like Dubai fountain, malls of Dubai, and Dubai aquarium are free while many others like Dubai Dolphinarium. Global Village, Ski Dubai, and more are chargeable but every bit worth your money. How much does nightlife cost in Dubai? For any city to observe a great nightlife, alcohol plays a significant role, but in Dubai, there are several restrictions in consuming alcohol. You need to have a proper license not only to sell alcohol but also to drink it. Yes, the Emirati citizens have to obtain a license to buy liquor even to drink in their homes. The cosmopolitan nature of the city of Dubai makes its nightlife happening in high-end clubs where liquor and dance are in full swing especially on weekends. Special ladies’ nights are also held on Tuesdays. Almost every month some popular DJ performs in these clubs. Some of the famous clubs and beach party destinations are Club 360, Trilogy, Boudoir, Mahiki, Nasimi beach and more. Dubai is very very hot. The desert city can be very punishing during peak summer months even after almost every tourist attraction of the city being air-conditioned. Don’t forget to bring hats, caps, full sleeve clothing, and lots of sunblock creams. You need not carry your laptop while traveling in Dubai. With the help of Cloud solutions from CloudDesktopOnline and CloudAppsPortal. access your Desktop and online files from anywhere with your favorite device. No special immunization is required before coming to Dubai. The entire UAE is pretty safe health wise. Famous cities like Sharjah, Abu Dhabi, and Ras Al Khaimah are just a few hours away from Dubai so make sure you come with a bandwidth to enjoy these places too. While in Dubai, don’t forget to spend an evening at the Sheikh Mohammed Centre of Sheikh Mohammed Centre for Cultural Understanding (SMCCU). The interaction will completely change your outlook towards the Islamic culture and religion. Dubai visa rules are subject to change but as of now, you can get a visa on arrival for 30 days without any charge. The free visa on arrival rule applies to most countries except a few nations. The list of nations is easily available on the net. To save heavy on food without sacrificing your giant appetite, keep an eye on the incredible happy hour meals and eat all you want lunches. 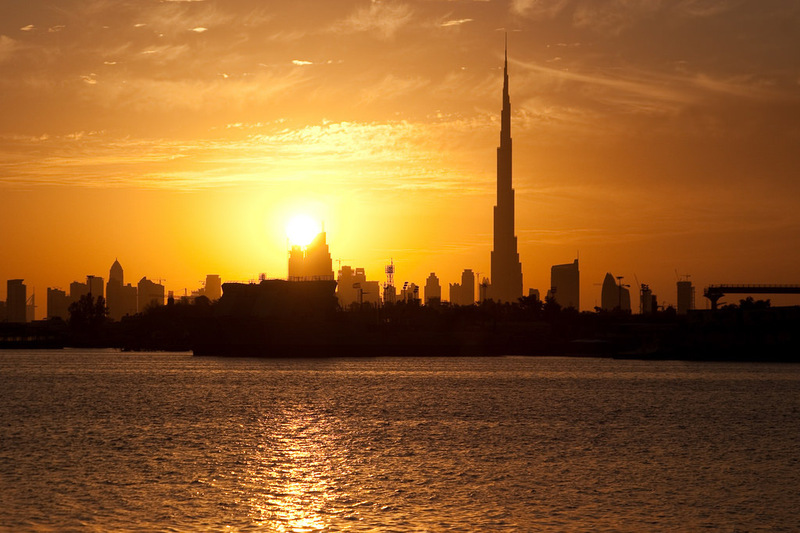 If you are planning to stay longer check out this 7-day itinerary to Dubai. Now you know how much does it cost to travel to Dubai! Follow our travel tips to save big and enjoy your holiday. Thanks for a pretty good article on Dubai, however would like to add a few points – hope you don’t mind. Travel by road – Uber and Careem work well in Dubai, with Careem edging it in terms of service. Eating – don’t forget the Dubai tradition of brunch, it’s well worth getting a great deal on a Friday Saturday or even evenings for all you can eat (and drink) deals. Saving money – Check out Guzzle, Cobone and best of all, The Entertainer Apps/books. The latter offers two for one deals in major restaurants, hotels, spa, services, tours and hotels – so two people can save an absolute fortune. Tks for the extra tips! This is such a comprehensive post! I’m saving this as a resource for any future trips we take to Dubai, thanks for sharing! 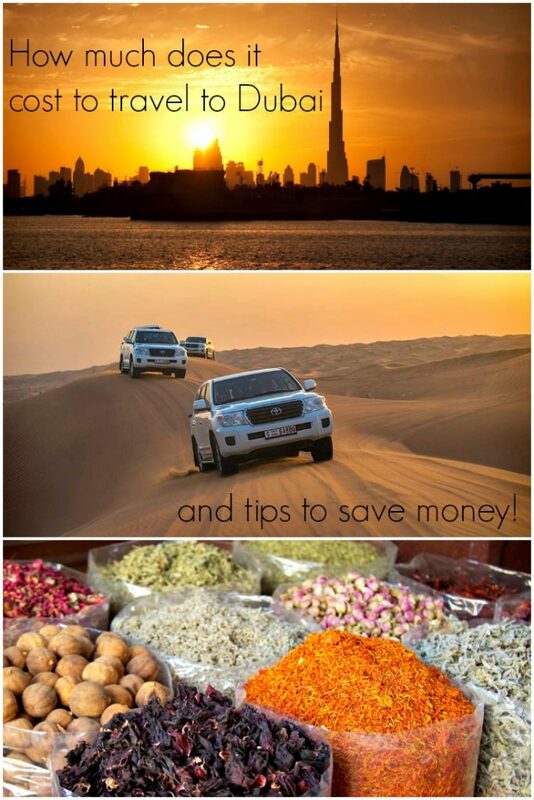 What a handy practical guide for visiting Dubai! Thanks for putting this together! I’ve never really thought of Dubai as a budget destination at all. I guess I associate with riches and that’s clouded my judgement. It sounds like you can do a lot here on a shoestring budget, which is great news for someone like myself. Like anywhere, it does depend on what you want to do! Will have to visit in the near future! I also thought the same. Always associated Dubai with heavy price tags. Good to see budget options there! This is a good break up of different expenses. So interesting to find out how large the expat population is. Thanks for providing some insight into Dubai facts and culture before writing the guide, which was amazingly in depth. I can see a lot of research and experience went into writing this. I will definitely come back to it when I visit Dubai next time. I’m looking forward to seeing police driving a Ferrari! Quite an informational post. You are right, quite contrary to people’s belief that Dubai is very expensive, It could be expensive or most expenive too if you want it that way. At an exchange rate of 1USD to 4AED approximately it could also be inexpensive if you know where to live and eat and use buses and metros. Of course some of the activities are bound to be expensive anyway. 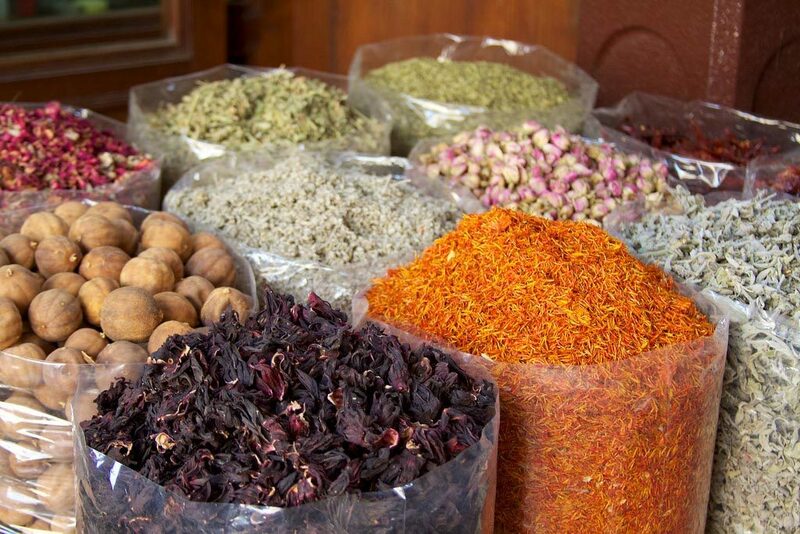 Dubai is definitely expensive in terms of other Middle East destinations, but we love it there. 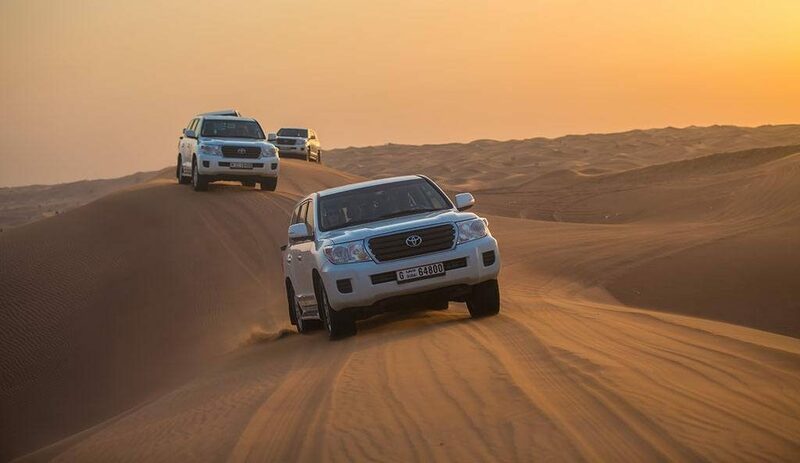 And going to the top of the Burj and dune bashing are must dos, in our opinion. The water park at Atlantis is also a nice way to spend an afternoon. Maybe on your next trip you can use some of our tips. Beautiful city everybody wishes to visit… Would love to be there someday.